If you aren’t following Sam Lam’s blog, “But at the end of the day…” you’re missing out. That game yesterday was everything that I wanted and it delivered. It was everything SJSU needed to show the world that they are still a team that can win big games. What we got was a thrilling, exhilarating game like I’ve never seen before. It was a game of two halves. It was the unstoppable offenses in the first half and the clutch defensive stops in the second half. Needing to win that game (and break the three-game losing streak) to make it back to a bowl game was a big deal for the program. 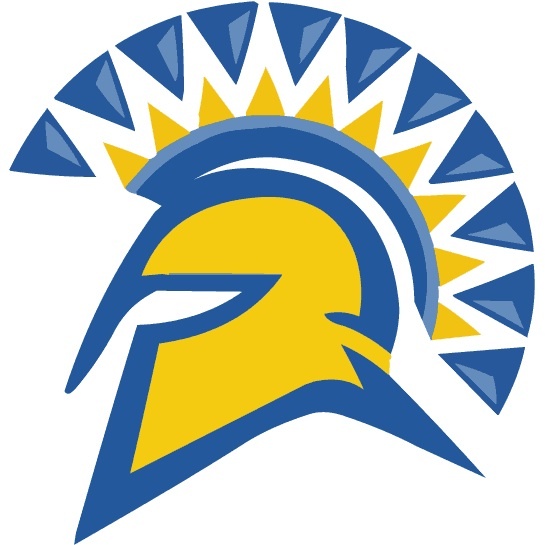 SJSU needed it so bad and taking out #16 ranked and undefeated Fresno State to do it in the process makes it so sweet. Enjoy this one, guys. You did what no one else in the Mountain West could do this year: beat the Bulldogs. Links to the different stories from around the state on Friday’s 62-52 shootout upset win by San Jose State over No. 16 Fresno State. 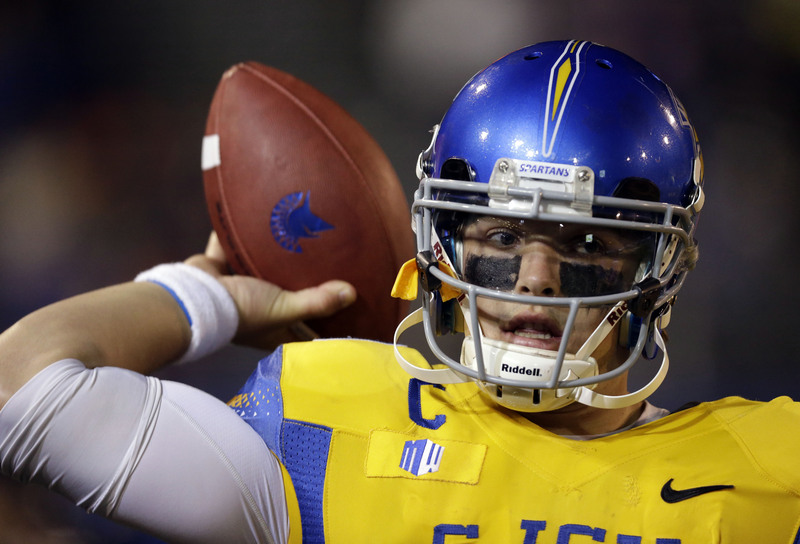 A month ago, Friday’s San Jose State-Fresno State showdown had all the trappings of a classic. San Jose State appeared to be cruising through conference with big wins over Wyoming and Colorado State. Fresno State was everyone’s favorite BCS buster. Much has changed in a month. San Jose State blew a double-digit lead to San Diego State and has yet to find its swagger, especially on defense. Fresno State’s schedule has been shown to be weak, as Rutgers and Boise State flounder; its BCS ranking has suffered as a result. A month ago, this looked like it would be for the Western division crown, as well as the newly minted Valley Cup. It’s for much less now, but still a lot. 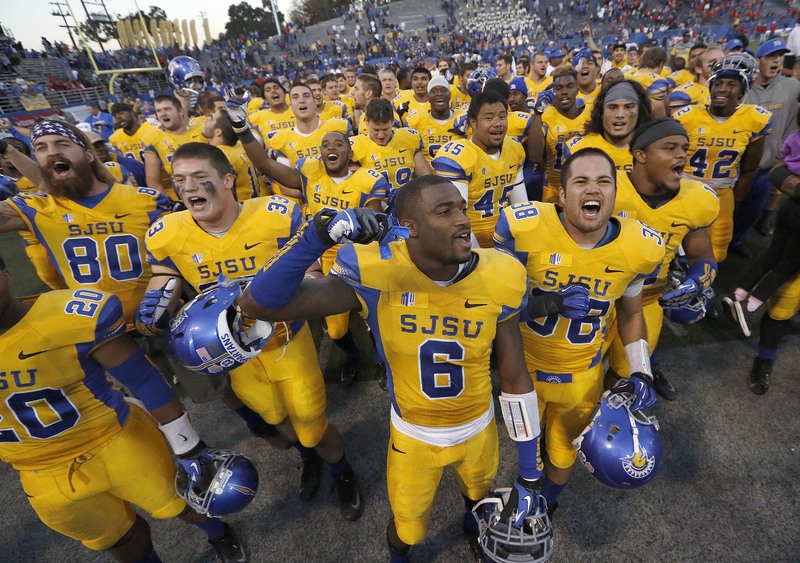 San Jose State isn’t even bowl eligible, and must beat the Bulldogs to even have a prayer at a postseason. Fresno State’s BCS hopes can die with a loss Friday or the following week in the Mountain West championship game. One play can be the difference between a trip to Phoenix with all the trimmings, or a disappointing slog to Las Vegas. One score could be the difference between more than $10 million for the Bulldogs. So, yeah, a lot is riding on Friday’s game. Many of us spend Thanksgiving doing two things: gorging ourselves stupid and pining over cheap crap to the point where we fight people over it at the nearby Walmart. It’s easy to forget that this is a day of thanks, and how much we have to be thankful for given how many in this country go without. The San Jose State wide receiver from 2004 to 2006, now a star with the Packers, spoke about growing up poor in the Bay Area with the NFL Network, and how thankful he is to have plenty now. He hasn’t forgotten his roots. He and his wife doing a lot of charity work in San Jose, where he grew up, and Green Bay. “I never want my family to go through anything that I ever went through,” he said. David Fales numbers are down this year; Why? David Fales stats are down across the board, but it’s probably not because he’s regressed. David Fales reached two team records as the Spartans get set to take on Navy on Friday evening. When he hit 155 passing yards in the game, he passed Adam Tafralis’ career mark for passing yards for a quarterback. When he threw his second touchdown in the third quarter, passed Steve Clarkson’s nearly 30-year-old passing TD record for a career. And yet, it was all hollow, because the Spartans didn’t win, and it was an interception — his 13th of the season — that helped sink the ship. Fales has not been the contributor he was last year despite some absolutely mind blowing performances, when he helped put himself and the Spartans on the map with an 11-2 season, a top-25 ranking in the final AP poll and a win in the Military Bowl. He was the NCAA’s most accurate passer last year, completing well over 70 percent of his passes. In the final year of the WAC, he was its best quarterback in a competition that wasn’t even close. By no means is he having a bad season, especially by San Jose State standards. But the preseason predictions and hyperbole of Fales and his team of receivers carrying the Spartans to the promised land were off. All of the numbers are down this season: TDs are down, passing yards are down, completion percentage is also down. He had already surpassed last year’s total for interceptions before Friday’s loss to Navy. Here are his stats side by side from last year and this year. Statistics don’t tell everything, though. Fales has looked better mechanically, and the changes instituted this year made by Rob Caragher and his staff may not have been conducive to winning games (particularly on defense, which is well beyond Fales and the offense’s control), but he’s looked better mechanically. When given time, which isn’t alway the case, his passing ability has dramatically improved. He looks like he’s also seeing the field better and going through progressions. The competition is better: The last year of the WAC does not compare in any way to the Mountain West, which is full of familiar — and better — opponents. The Spartans effectively replaced UTSA, Texas State, Idaho and New Mexico State, all mediocre teams last year, with Minnesota, UNLV, Wyoming and Fresno State. With the exception of Wyoming, all feature better defenses and all are better teams than the four listed last year. Fales could dissect easier opponents much of last season, but this year hasn’t afforded him such an opportunity. Perhaps we as fans and journalists overestimated what he could do because of the competition. The pressure has been greater because the defense is bad: Last year, the Spartans’ defense was serviceable. It could get a stop, and was able to force turnovers. This year, there are good players, but the defense is a terrible unit. It comes back to poor coaching — Yes, I’m calling out defensive coordinator Kenwick Thompson — and youth. The Spartans defense was going to take a step back this year, and fans knew that, but they look like the couldn’t stop a high school football team this year. That has meant the Spartans have needed their offense to respond each time they get the ball; they never get the benefit of being ahead. And that has probably affected Fales negatively this year. Injuries have hurt the offense: San Jose State lost Tyler Ervin for the season earlier this year, and they got lucky because freshman Jarred Lawson proved to be just as good in the backfield. Chandler Jones missed significant time, and Noel Grigsby was lost for the season in the first few games. The replacements have been largely inexperienced and young, and don’t have the rapport with the senior quarterback as the veterans do. Fales stock has fallen a little this year when it comes to the NFL draft. CBS Sports projects him as a fourth or fifth round pick this year, the 155th best prospect and the 12th best quarterback. Earlier this season, the projections were much more optimistic. He can bring some of that optimism back when the senior all-star games and draft combine roll around. The senior quarterback is going to leave San Jose State as the best at that position statistically in the school’s history, and has likely penned only the first few chapters of his football career.